The walk-in bathtub is a special type of tub designed for enhanced safety when compared to the traditional tub. Their popularity is increasing, as many people begin to see the massive benefits the tubs offer. Many seniors use the walk-in tubs in their homes, although the tubs are great for use in any home. With a door and built-in seat, these walk-in tubs help the user comfortably and safely take a bath, despite issues with mobility, pain, or other challenges. The tubs are larger in size than the traditional tub, and that’s just the start of the amazing benefits. When a walk-in tub is added to a bathroom, it provides the user with more freedom and an enhanced quality of life. This includes those with mobility issues, people with disabilities, seniors, and others. The tubs vary in style, but all feature handles that are both easy-to reach and easy-to use so this isn’t ever a problem. There’s also a shower attachment so reaching around your back isn’t necessary, and your bath can be an even more fulfilling experience. Although designed for safety, comfort and style aren’t forgotten in the walk-in bathtub. Users will find the tubs hold nearly three-foot of water, so it is easy to sit back, relax, and enjoy the simple pleasures that life offers. They’re stylish, so forsaking the style and appearance of the bathroom isn’t a concern. Best of all, adding a walk-in bathtub to your bathroom is simple! You won’t need a contractor to tear your existing tub out, and endure days of work and headache. 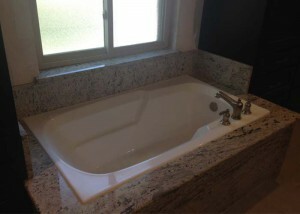 Instead, the walk-in tub is placed over your existing tub without mess, headache, or hassle. The job takes about an hour, and the job is done! If you’re interested in the addition of a walk-in tub at your Plano home, finding a walk-in bathtub company in Plano, TX is the first step. Request an estimate for the walk-in tub addition, comparing it with others in the area. The cost of a walk-in tub is extremely reasonable, especially considering the many advantages offered.